You know what's cooler than a Samsung 950 PRO? The Xeon D-1540 SoC platform has PCIe 3.0 by 4 lanes, for both the single PCIe slot, and the single M.2 socket. That means the speed should be roughly the same, regardless of where it's located. That's something I'm about to test. But first, I had to get the 2nd M.2 device physically installed. That's where this simple adapter comes in. Uses my PCIe slot for M.2 storage. As the box label says, "Transparent to the operating system and no driver required." For me, that'll be Windows 10 for baseline speed tests, then VMware ESXi 6 soon thereafter. Problem solved, for about $20. 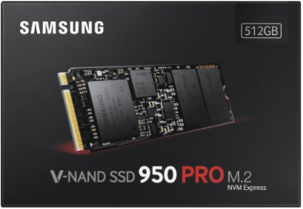 If you're thinking about getting the world's fastest consumer SSD, note that the Samsung 950 PRO doesn't come in traditional 2.5" laptop form factor. It's M.2 only. If your system doesn't have M.2 on board, you can add it as secondary (non-bootable) storage. But you'll only get full speed if your PCIe slot is 3.0 x4 (4 lanes), a rarity until 2015's arrival of Intel's Xeon D-1540 and Skylake chipsets. Installs in about 3 minutes, comes with the tiny Phillips head screw you need. I did have to move the included stand-off to the 2280 size position, which is the most common length of M.2 these days. The included low-profile adapter bracket was also needed, so it could fit into my Supermicro SYS-5028D-TN4T system with that compact X10SDV-TLN4F motherboard. I'm about to find out how well it works! You can also be sure I'll be recording video of those Windows 10 speed comparison tests, just as I did 2 days ago for the first M.2 unbox/install, and last night, for the Windows 10 boot from NVMe and speed testing. Of course, I'll be updating this article with the results, but the video of the installation is already available below. 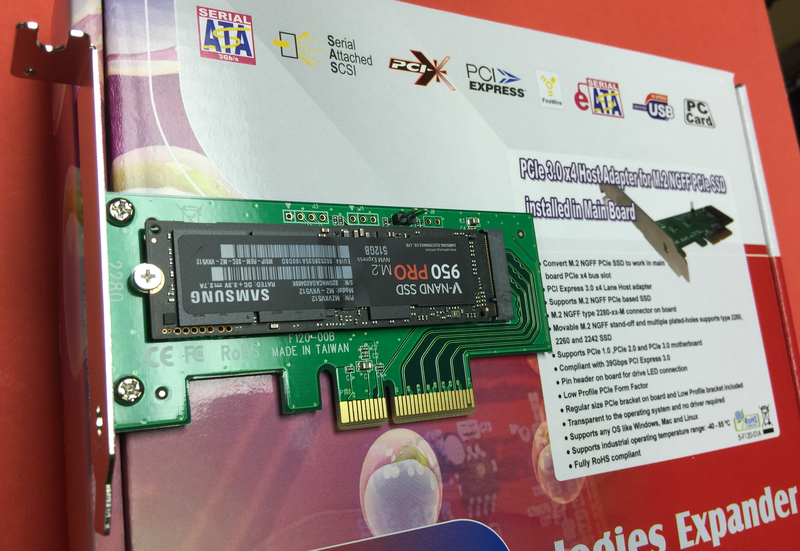 Installing the Samsung 950 PRO M.2 NVMe SSD into a Lycom DT-120 M.2 PCIe adapter, then installing the assembly into the SuperServer. Interesting to note that the box describes the "Pin header on board for drive LED connection." Could make for some fun custom NVMe-only blinky light possibilities! From a few brief tests, so far, it does appear the speed of my C: drive matches my D: drive (identical 950 PRO, but installed in the Lytron PCI adapter). 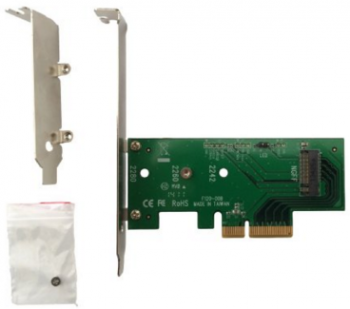 In other words, the PCI card is just passing signals right through, with no bridge chips to slow things down. Turning the fan higher and leaving the lid on resolves any minor issues with thermal protection kicking in. At the expense of fan noise, of course. That D: drive on the Lycom PCI adapter held up a little longer. Seems unlikely that you'd have an issue with temperatures in normal use, and the speed drop is only roughly 20%, and only seen at higher transfer sizes. More details to come. 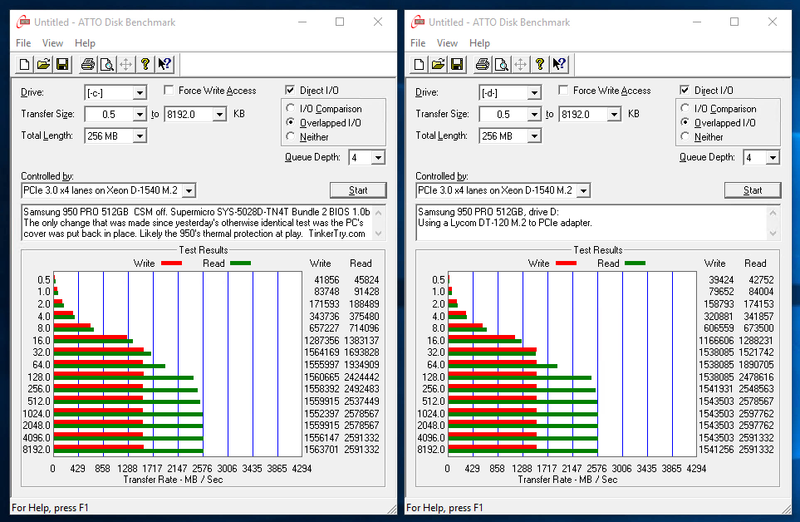 The results are in, the speeds seem to be essentially identical, C: (motherboard M.2 socket) or D: (M.2 to PCIe adapter). Also interesting that my torture test of C: and D: running ATTO simultaneously held up quite nicely, seen on video. Samsung 950 PRO x2- ATTO Disk Benchmark tests run on C: and D: simultaneously, results barely slowed.